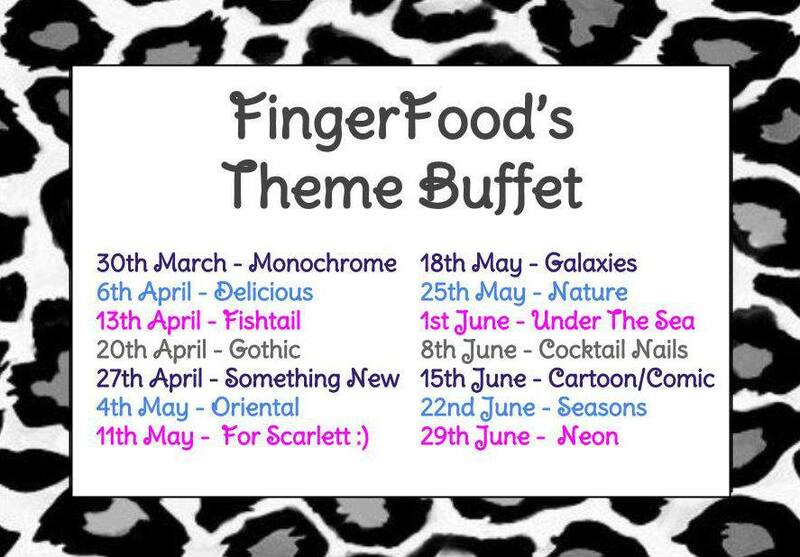 The theme in today’s FingerFood’s Theme Buffet challenge is fishtail. 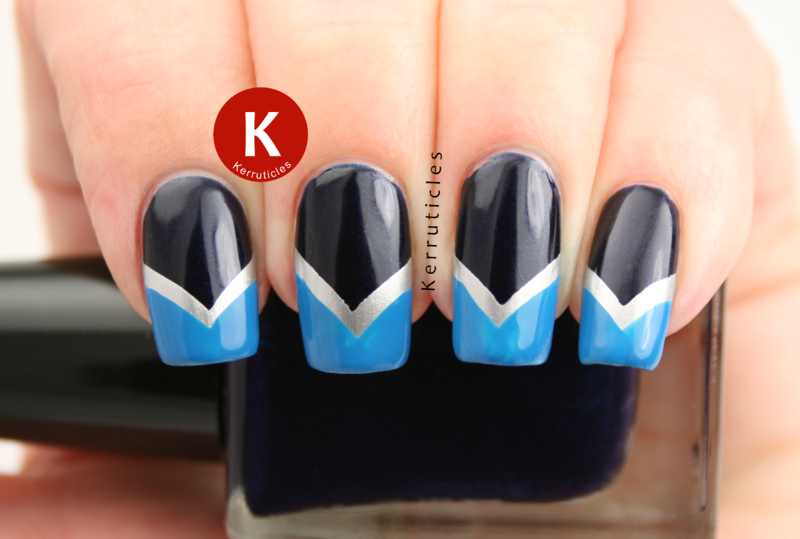 Now to some people, fishtail means a braided pattern, and to others it means a curved chevron French tip sort of design. I’ve gone with the latter (as it’s easier – ha ha), but I have done braided nails before. I started with a base of the polish I was already wearing: Rimmel Midnight Blue. Then, using curved chevron guides, I added tips in Barry M Silver Foil Effects. The blue – Rimmel Blue Eyed Girl – was freehanded on, as I couldn’t be sure if I’d get the lines evenly spaced if I used more French tip guides, as they would have to cover up what had already been painted. As it turned out, I was a fraction out with the right-hand sweep on my ring finger, but it’s hardly noticeable. I really love these nails. They’re very “me” … the colours, the geometry, the lines, the symmetry. Yeah, it’s always a nerve-wracking moment when you’re just about to do the freehand bit. I just hold my breath and go for it quickly. Thankfully, it’s been successful this time! Love this completely – the colours, the lines, its simply to die for. Awesome job! Sometimes the simplest-looking designs are the most beautiful <3 I'm always amazed at how flawless and easy you make these manicures look! 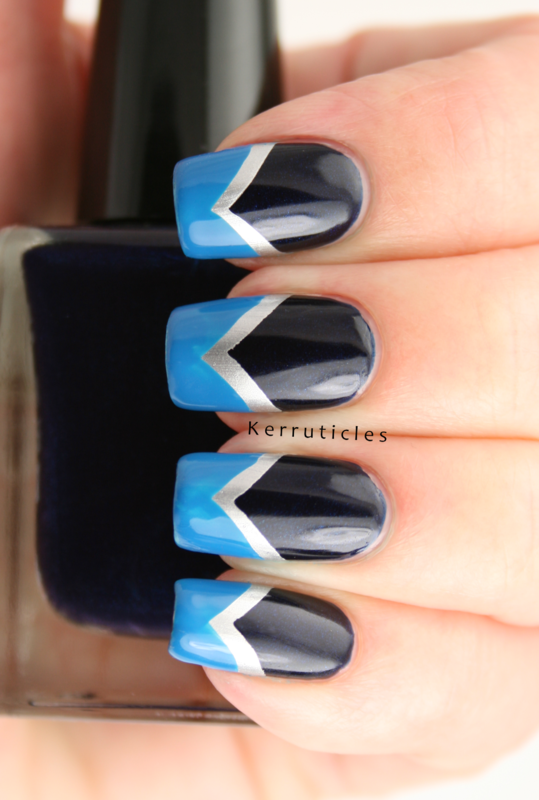 This is such a neat looking manicure! The colors and design is absolutely perfect! Oooh, these are great! I love that blue! Fab freehand work Claire, these are amazing!